A face washing cream that removes melanin-filled cornified cells and unclogs pores to reveal moist, radiant skin with a translucent glow. 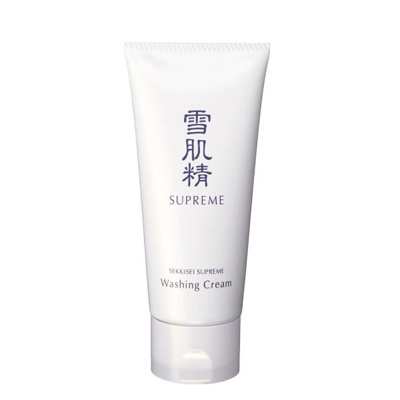 Creates rich, soft foam that gently envelops the skin, leaving it feeling moist and clean. Harnessing extremely fine ingredients such as Melothria extract, Chinese Indigo extract and Chinese Soapberry extract to prevent oxidation of skin while promoting cell-metabolism. Delicate foam enhances the efficacy of skin cleansing and circulation, preparing your skin for rapid absorption of subsequent beauty agents. Take the Washing Cream in the palm of your hand, cupping it slightly like a saucer. With the other hand slightly erect, lather up the cream that’s in your other palm. When you have a bit of foam, add a little water and lather up even more to create rich, fine-textured foam. Using the thick lather as a cushion, use both palms in a circular motion to spread the foam from the chin up to both cheeks. Then, use the same circular motion to spread the foam from the bridge of your nose to the forehead. Then, putting particular emphasis on the middle finger, wash around the mouth, nostrils, bridge of the nose and around the eyes gently, without applying too much pressure. Rinse with cold or lukewarm water, especially making sure to remove foam from the hairline and under the chin. Afterwards, remove the water from your face by pressing a clean towel lightly over it.